It is not a secret that what we eat is reflected not only in the appearance of the figure of our body but also on the state of our skin. This applies not only to food but also to the spices that we usually add to food. But at the same time, many spices from the kitchen arsenal can be successfully used in home cosmetology to solve some skin problems. 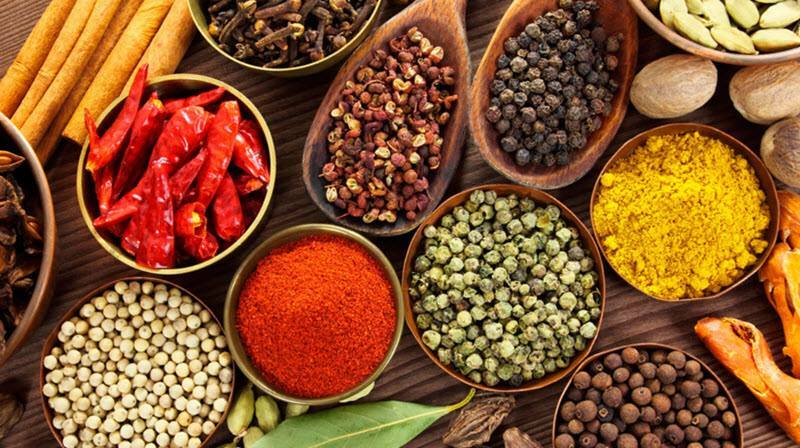 It is known that the spices and flavorings in ancient time women used as natural cosmetics. This explains the fact that many world brands use spices in their products for skin care. It is useful to know which homemade natural spices-based cosmetics will help improve skin condition. Here are some proven and effective spices for skin care collection. Ginger is one of the most popular spices for skin care used today in cosmetology. It is not surprising after all this spice is suitable for any type of skin. And its medicinal properties were known long ago, which explains the name (ginger in Sanskrit means “universal medicine”). See for yourself: if you are the owner of oily skin, the mask on the basis of ginger can help reduce sebum production, which clogs the enlarged pores and promotes the development of problems such as acne and pimples. You can also get rid of greasy and give her face smooth and beautiful color. If your skin is dry and sensitive, the ginger will help protect you from a variety of adverse weather influences. Ginger also has antioxidant properties, so it helps to successfully fight the first signs of aging skin. Cosmetic products, in which there is an extract of ginger, tighten the skin that has lost elasticity and makes it supple. This plant of the ginger family is famous primarily for its antiseptic and anti-inflammatory action. Turmeric is a great way to rejuvenate the skin, it disinfects the skin, stopping inflammation, is added to the composition of masks and scrubs. Turmeric contains antioxidants that will stimulate the growth of new cells and help maintain the elasticity of your skin. It can also be used to improve the condition and tone of the skin. Turmeric is especially suitable for owners of oily skin. This spice can also be used to cure acne on the face, it is enough to mix turmeric with sandalwood paste or with a few drops of rose water. This mixture will additionally help nourish those skin areas that have become too dry. Other useful ways. Apply turmeric mixed with milk on your face and leave for a while. Also, along with honey, it can be used as a mask for the face. For various rashes on the skin, mix the spice in warm water and apply the mixture on the affected areas, hold for a few minutes. Cinnamon is one of the favorite spice sweet lovers. Moderate amounts of cinnamon can also be a unique and wonderful means to care for your skin. The thing is that antioxidants, phosphorus, magnesium, iron and other micro and macro elements that are present in large quantities in cinnamon, has a cleansing and nourishing properties. It also tones up the skin and improves blood circulation, which helps to activate the power of skin cells. This spice is also rich in vitamins. Thus, for example, vitamin E contained in cinnamon promotes the renewal of the skin cells. Vitamin C is able to give the skin smoothness and elasticity. A vitamin K is responsible for the beautiful color of the face, as improves the performance of the blood vessels, which ultimately affects the overall condition of the skin. Most often, this spice is recommended for people with dry and sensitive skin. In the cinnamon contains thiamine, able to cope with the irritation and swelling, as well as choline, which enriches the skin with essential micronutrients. Mask with cinnamon recommended for women with oily skin and inflammation on the face skin. The cinnamon perfectly clean pores of dirt, has the antibacterial effect, promotes more effective penetration of bioactive substances into the skin. To prepare this mask, take 3 tsp. Oatmeal and 3 tsp. Powdered milk, 2 tsp. Cinnamon powder and 1 tsp. Oil solution of vitamin E. Mix and apply on your face, then rinse off after 3 minutes. The smell of vanilla is one of the most attractive. No wonder, since the XVIII century, vanilla was considered an aphrodisiac because its scent evoked a feeling of enjoyment and pleasure. To date, vanilla is one of the most popular tools in cosmetology. It is often added to the gels, in perfumes and products for skin care. Most often, for the manufacture of these means use an essential oil obtained from vanilla. This component is able to reduce inflammation or peeling of the skin. The vanilla has a beneficial effect on sensitive, dry, normal and mature skin. Vanilla is considered an excellent ingredient for improving skin elasticity, making it more moist and tender. Vanilla oil has a bleaching effect on the skin and has a matting effect. You will quickly notice the results. The skin becomes more supple and soft. Red chili pepper – is not only an excellent seasoning but also a wonderful folk remedy for beauty and health of your skin. Many people in India are still using this spice as an antiseptic. The thing is that Red Chili pepper has a lot of nutrients. First of all, it is a high content of vitamin C, which in pepper 2-3 times higher than in citrus. Also, chili pepper is a source of carotene, rutin, and most B vitamins, especially B6. This spice is rich in potassium, magnesium, iron, and phosphorus. All of these substances are essential for healthy skin. Contained in red pepper, capsaicin dilates blood vessels, reduces swelling and inflammation. But the main feature of hot chili pepper is its ability to increase blood circulation, which has a positive effect on skin color. Black pepper contains piperine, rich in vitamins A and E, iron and calcium. This spice perfectly tones and reduces inflammation. Using the essential oil of pepper, you can get rid of acne and age spots. Here is the recipe for eliminating dark spots on the face. Mix 1 tablespoon of yogurt with 1 teaspoon of ground black pepper and apply the mixture on your face. After a couple of minutes, rinse. Black pepper scrub speeds up blood flow, relieves fatigue and relieves muscle pain. Massage with this scrub helps to get rid of cellulite. Carnation is often used as the cosmetic oil which has the miraculous effect on the skin, toning it. This spice, thanks to its content of phosphorus, magnesium, calcium, sodium, and iron, with strong antiseptic properties which help fight blackheads and pimples. Please note that with cloves you need to be extremely careful. Due to the presence therein of a substance such as eugenol, clove oil cannot be applied to the skin undiluted as not to cause irritation. Garlic has antimicrobial properties, but the specific smell has significantly influenced its use for cosmetic purposes. Not every woman is ready to use it as a face mask or lotions. And in vain, the essential oil Allicin, which is part of this vegetable, gives a healthy complexion, makes it young and toned. In addition, garlic contains active substances, polysaccharides, and vitamins. Especially it is recommended to apply for acne and inflammation. Applying homemade natural cosmetics with spices made by yourself, you will provide comprehensive support for your skin. Good spices for skin care will help to gently eliminate the existing skin problems and also provide an excellent basis for combating natural factors of aging.